Buuz (Mongolian: Бууз; Buryat: Бууза, Buuza) are a type of Mongolian steamed dumpling filled with minced mutton, or beef meat. The meat is flavoured with onion or garlic and salted. Occasionally, they are flavoured with malted fennel seeds and other seasonal herbs. Some households add mashed potato, cabbage or rice depending on their preferences. Left: Cooked and uncooked buuz. The meat ball is then placed inside a small pocket of dough which is folded around the ball with a small opening at the top and in the chef's own personal style. The buuz is then steamed and eaten by hand, with the dough pocket catching the juices of the meat. Buuz is an example of authentic Mongolian cuisine. The dish is traditionally eaten at home on Tsagaan Sar, the Mongolian New Year. It is also offered at restaurants and small cafes throughout the capital of Ulaanbaatar. 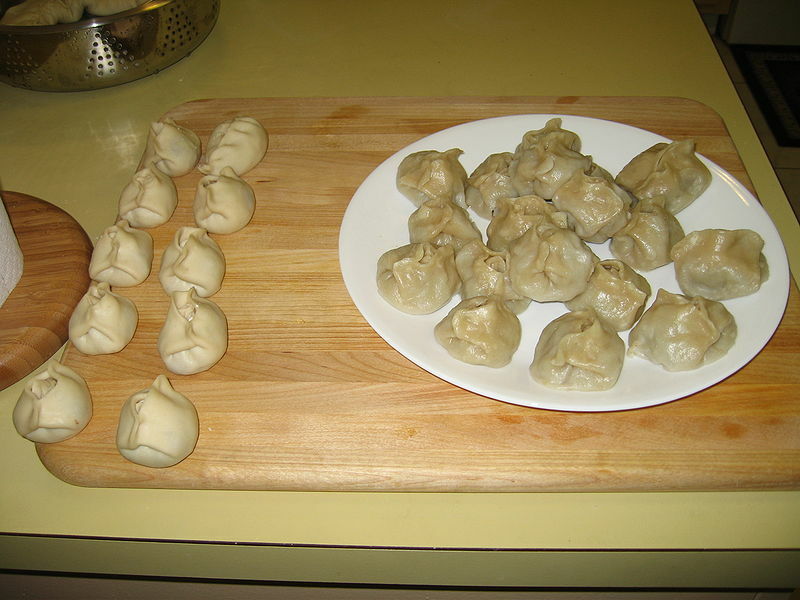 It is similar to another Mongolian dumpling, khuushuur, except that the latter is not steamed but fried.